Preschool Soccer NJ Sports House & First Shot Soccer present Little Tikes Indoor Soccer for 3 and 4 year olds. Preschool Basketball IYB Basketball presents a new basketball class for 3, 4, 5 & 6 year old boys & girls called IYB Lil’ Ballers Intro to Basketball & Fundamentals. Preschool Tball NJ Sports House & PS2 Baseball present Little Tikes Indoor T-ball for 3 and 4 year olds. Preschool Dance NJSH Dance program will be run by the amazing Farrah Corez! Youth Baseball NJ Sports House has several baseball programs as well as cages to rent year round! Youth Dance & Cheer NJSH Dance program will be run by the amazing Farrah Corez! Youth Field Hockey This Fall NJ Sports House is Introducing their NEW Girls Field Hockey Program! This program will be providing clinics and weekly training for girls in grades 1-8 and is perfect for both the beginner and advanced player! Youth Soccer First Shot Soccer is a recognized leader in the development of youth soccer in northern New Jersey for over 25 years. Youth Volleyball Phoenix Volleyball NJ is pleased to announce the Volleykids program. Freak Strength Speed School Freak Strength is made for anyone that is looking to enhance their performance. Whether it be general or sports specific, you will be hard pressed to find a staff in the area more qualified than ours! Youth Flag Football This fall NJ Sports House is happy to announce the start of the NFL Flag Football League for ages 5-13! Leagues will take place on Saturday mornings and will be run by our amazing coaches!!! A Love For Learning ALL Academy and Learning Center is now located in NJSH! A Love for Learning is an enrichment center that provides fun and creative classes for students to explore and learn. Adult Lacrosse X-Treme Lax Factory will be running all their Lacrosse programs out of our Facility! Adult Yoga Join our terrific instructor Matt Plotkin for an early morning and evening class of YOGA! 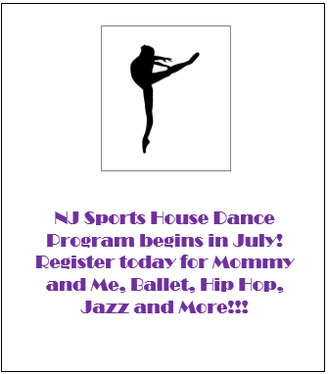 NJSH Dance program Begins January 23rd with Some FREE TRIAL CLASSES! Full Classes begin January 30th! You will receive our newsletters on upcoming camps and programs. Also, receive tips on how to succeed in your sports!